Omron 5 series is one of our top recommendations. These blood pressure monitors are excellent value for money. They are accurate, have most of the features you need and are available at great price. If you are looking for more features such as bluetooth connectivity then you should look at 10 Series BP786N or 7 Series BP761N. In case you are interested in a cheaper model at the expense of some features 3 series BP710N would be a good choice. Omron discontinued BP742 in favor of BP742N. There are few minor differences between the two model. BP742 have a memory of 60 whereas Bp742N have 100. The BP742N had BP Level Indicator, which is missing in the older version. BP742N default cuff size is from 9” to 17”. BP742 default cuff size is 9” to 13”, though it is compatible with larger cuffs but needs to be purchased separately. All the Omron blood pressure monitors are clinically tested. Advanced accuracy ensures that the blood pressure monitors provides precise readings. Fitting is one of the main criteria to get correct readings. If the cuff is loose or not placed properly, the monitor will not provide correct readings. The 5 series upper arm monitor comes with wide range D ring contoured cuff of 9” to 17” circumference, generally it fits standard to large adult. 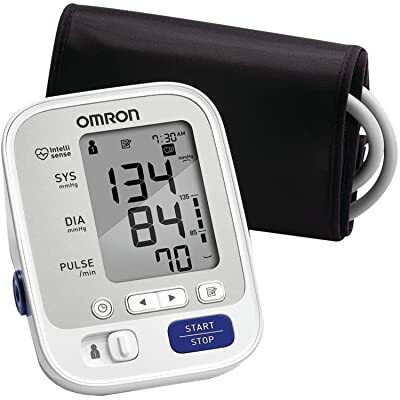 Large Display: The Omron monitor have a large display and it displays the systolic, diastolic measurements and pulse rate. BP Level Bar Indicator: Omron made it easy for you, you don’t need to remember the normal blood pressure readings. Once measurements are taken, it will compare your readings with the internationally recognized guidelines for normal blood pressure. BP level bar will give you a visual idea of how your blood pressure is doing. Multi User with Large Memory: Omron 5 series upper arm monitor support 2 user mode. It have a button to switch the user. It have 100 memory space, each user can use 50. Advanced Averaging: It is suggested to take three consecutive readings and then take average to these three readings to get the appropriate blood pressure readings. Omron 5 series have this feature of advanced averaging where it will automatically takes averages of the the last three readings and provide the average of those readings, making it easy for you to get precise readings. Irregular Heartbeat Detector: Since the monitor detect and display pulse rate, the device have a capability to identify the irregular heart beats with the special icon. If you are getting irregular heat beats oftenly while monitoring the blood pressure, then it is a good idea to consult a Doctor. The 5 series have some of the best features for very reasonable cost. Price is comparable to 3 series monitor which have lesser features. There are few products in the market with great features and very reasonable price, Omron BP742N is one of them. It have features like BP level bar, Advanced Averaging and multi users and is very cost effective. I recommend this product and can assure you that this is worth your money.